The move to iOS 7 brought with it some pretty wild changes in how our iPhone, iPads, and iPod Touches looked. So wild in fact that it was the single largest update to iOS since the inclusion of the App Store. While most have accepted these changes in appearance as-is, many people have issue with some of the default settings. From hard to see screens to text that’s too thin to see well; there’s definitely some changes that can be made. 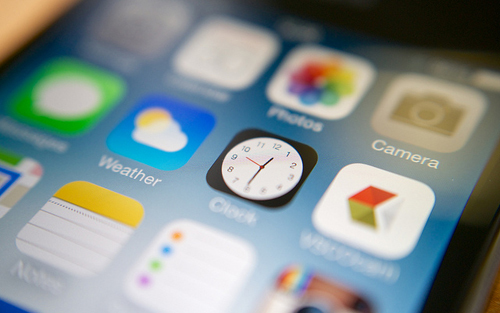 If you’re one of those who want iOS 7 to look a little better, check out the tips below to change up iOS 7’s appearance. 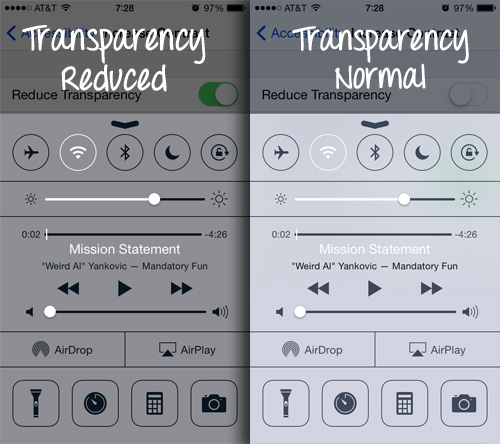 iOS 7 changed up how toggle switches look in the system. The new look they tout can be somewhat confusing to see at first glance what is turned on and what is turned off. Apple was aware this may happen, and included a setting to give the ambiguous switches the traditional |/0 labels for On/Off, you just have to turn it on. Open up the Settings app, then tap on General > Accessibility. Next, tap the switch next to On/Off Labels so you see green and now your switches will show a 0 for off and | for on. While on/off labels are great, another issue with iOS has to do with the buttons that move you around in the system. 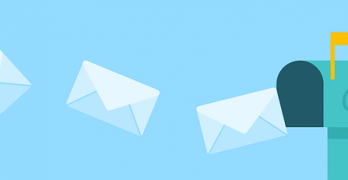 These can easily be confused with action buttons, making it hard to navigate around the system. You can turn these text-based buttons into arrows with one setting, though. On the same Accessibility screen you accessed above, tap the toggle next to Button Shapes and now any button that helps you navigate will have a shape. iOS 7 is big on transparency and giving the impression of layered windows, but sometimes this can cause issues with readability and understanding what window is on top. If this bugs you, it’s easy to change up so there’s less transparency and more readability. Staying in the Accessibility screen we got to in tip #1 on this page, this time tap on Increase Contrast and turn the toggle next to Reduce Transparency ON. You can turn Darken Colors and Reduce White Point on as well to help give better contrast, too. Speaking of better visibility, many have complained about the visibility of the new font in iOS 7, stating that it’s too thin. Pair with this a busy background and it can be nearly impossible to see things like the date and time. Apple is aware of this complaint too, and offers a solution if you would like to have a stronger font. 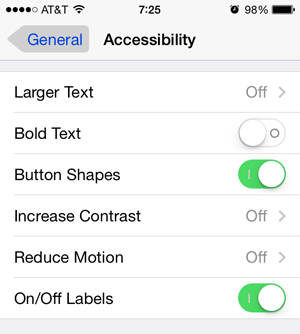 Open up the Settings app > General > Accessibility and turn Bold Text ON. 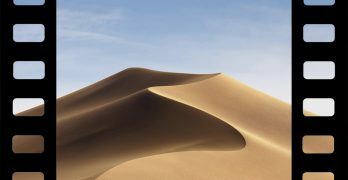 This will give your font a much bolder look, and you will have to restart your device for the changes to take effect. Parallax was a big feature in the overall look and feel of iOS 7, but the setting made some users feel uneasy when using their devices, and the added animations in the folders seemed to others as unnecessary. Both these can be fixed by turning a simple setting ON in iOS 7. 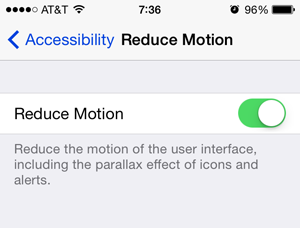 Staying in the Accessibility section of the Settings app, tap on Reduce Motion. Here, turn this toggle ON and now motion will be reduced system-wide. Note: You can turn the Parallax effect off for just your wallpaper while setting a new image. This will turn Parallax off as well as other items throughout the system. If bold text isn’t enough for you, you can actually increase the size of the text shown inside of iOS. 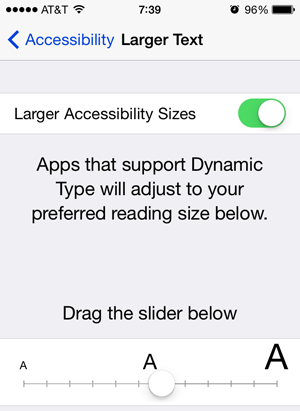 Many apps and sections inside of iOS have text that can be adjusted to be larger or smaller depending on your needs. This is adjusted in one place and should update most apps and settings pages. 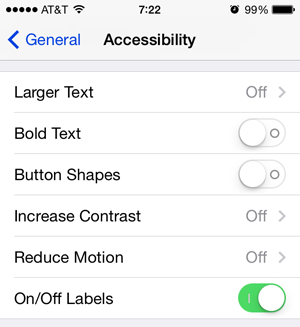 On the Accessibility section of the Settings app, tap on Larger Text and turn the toggle ON. Next, adjust the slider to the size you want and exit to finish the process. Now any app that uses this for their font size will update automatically.